There have always been pulp inspired comics even during the heyday of the pulps. There were Shadow and Doc Savage comics etc. For the most part most of those were badly done rip offs of the prose tales. As time went on pulp characters like Tarzan and others continued to find their way into comic books from various publishers. Since the advent of the New Pulp Movement (and yes, it is a genuine movement) we’ve had some pretty drastic highs and lows in pulp inspired comics. DC’s abysmal New Wave was a major disaster which pulp enthusiasts predicted would flop long before the company had released a single title. DC attempted to re-do pulps and completely alienated the one audience that might have helped them win this market. Idiocy on a grand scale was evident. Moonstone Comics gave it a shot with their Return of the Originals but most of their books, though well intentioned, came across half-baked in weak production values across the board. Offered up at a time when the company was making a very serious change to the more lucrative prose books, Moonstone pulp comics were really a sad misfire. Soon thereafter Dynamite hit the scene with their big splash reviving the Green Hornet; never really a golden age pulp but a pulp character nonetheless. And with Matt Wagner’s Green Hornet Year One, Dynamite hit a solid homerun. Soon they were following this up with the Shadow, a new Spider and ultimately their over-the-top group pulp team-up, MASKS. Thus today when a fan says pulp comics, they immediately think of Dynamite. Not a bad connection to have instilled in your readership. But Dynamite and Moonstone aren’t the only ones doing pulp comics. Dark Horse has had tremendous success with their Conan series these past few years and even dabbled in New Pulp creations with Mike Mignola’s creation of Lobster Johnson. 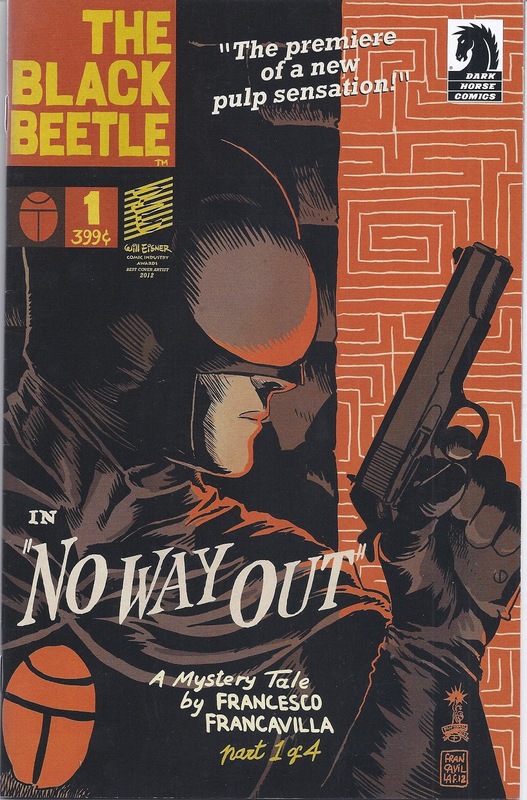 Now they’ve delivered a brand new classic pulp hero in Francesco Francavilla’s THE BLACK BEETLE. This book is easily one of the best pulp comics ever done with wonderful, moody artwork and a typical fast paced purple prose plot that is pure fun to read. 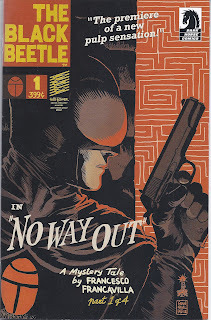 Francavilla has been a long time pulp fan as is evident by his own website and when Dark Horse recruited him a while back to do covers, it didn’t take a Nostradamus to predict he would soon be delving into the pulp field with his considerable talent. If you aren’t picking up THE BLACK BEETLE you are missing tons of great pulp adventure. This is offered up as a four part mini-series. This reviewer truly hopes its only one of many to come. 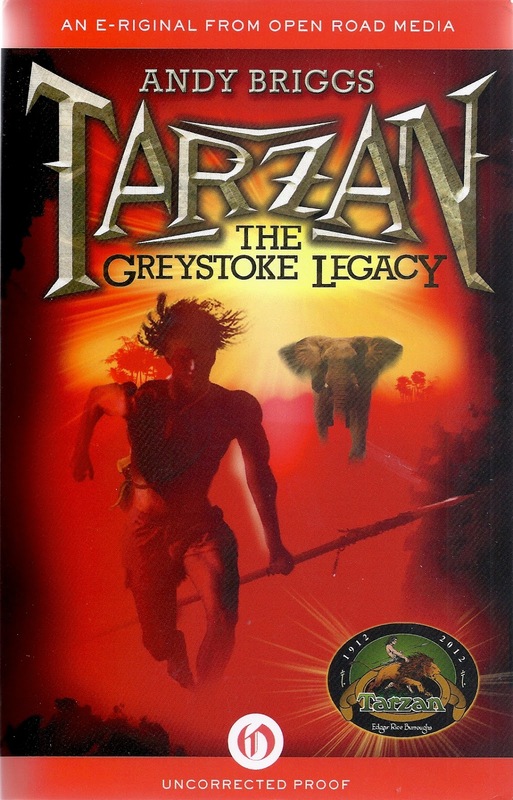 We’d vaguely heard mention someone was going to be re-launching a new, modern version of Tarzan a while back then promptly forgot all about it. These kind of re-imaginings have been tried before with various pulp heroes; most of them have failed miserably and are better left forgotten. Thus when one of the marketing agents for Open Road Media contacted us about reviewing Andy Briggs new Tarzan books we were curious enough to accept their gracious invitation. The books arrived two weeks ago (they are also available as Ebooks) and we were anxious to dig into them. It is important that we make it resoundingly clear that Tarzan of the Apes as created and written by Edgar Rice Burroughs is one of our favorite fictional characters. Having discovered Burroughs books in paperback format during our teen years, we devoured most of them and particularly cherish the first two; “Tarzan of the Apes” and “The Return of Tarzan.” Together they tell one of the most amazing yarns ever put to paper and from which an entire cottage industry was born. Tarzan is easily one of the most recognizable figures of all times and has been portrayed in movies (starting with the silent era), TV series, comic books, radio and who knows what else. His venerable tale is of man’s daily struggles with survival, the preservation of his natural environment and the steadily encroaching beast that is modern civilization. 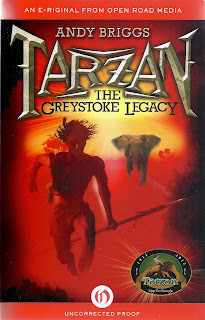 After having read, “Tarzan : The Greystoke Legacy,” we confess to having been wonderfully surprised at just how well it was both conceived and executed. Briggs is a truly talented writer who is obviously a true fan of Burroughs’ original stories and he reshapes the origin of the Ape Man with both a logical presentation and a great deal of reverence for the classic source material. Unlike Burroughs, who lived in a time when his background setting for Tarzan was a still largely unexplored “Dark” Continent, Briggs is challenged to offer us a hero whose jungle home is a rapidly dwindling landscape endangered daily by multiple factions. Burroughs never once, in his many books, ever offered us scientific details of the wildlife and flora of the savage jungle he wrote about. Not so in this retelling. Yet, despite his handicap of portraying an authentic wilderness, Briggs never loses sight of the intrinsic nature of his hero; Tarzan is a savage being nurtured by the law of the jungle. He kills his enemies and protects his friend, be they beast or human. Jane Porter is a troubled, lonely young woman, who has followed her father into Congo where he and his partner are operating an illegal tree-cutting operation. When mysterious acts of vandalism begin plaguing the camp and slowing down the work, those in charge believe the sabotage to be the work of militant rebels hiding deeper in the jungle. One night someone sets fires to the machinery and Jane, disorientated by an explosion, awakens to find herself lost in the jungle. When he is found and rescued by a half naked white man calling himself Tarzan, she is propelled into an adventure that will both alter her world view and awaken an inner strength and courage she didn’t know she possessed. All because of this strange, mysterious man who dwells amongst the giant apes of the forest. The last thing this reviewer desires is to spoil the exuberant, grand adventure this book presents by giving away scenes that are both fresh while echoing the iconic trappings of this legendary figure. “Tarzan : The Greystorke Legacy,” is a rousing, hugely entertaining read that respects it heritage while offering us a truly exciting “new” Tarzan for our times. We can’t wait to dig into book two. Stat tuned, Tarzan fans. Getting this book was pretty much like getting an extra Christmas gift for this reviewer. Go through these archives and you will discover we’ve been reading Van Plexico’s Sentinels series since day one; and applauding all of them. Of course the inherent danger with any long running series is that the writer will become tired of the concept and characters and begin to offer up deluded stories missing the verve and punch of his or her earlier entries. So in the wake of the Sentinels miraculous victory over these outer space threats, the team finds itself divided. With their leader, super powerful Ultraa, locked in stasis in a giant red gem, Pulsar (Lyn Li) returns to Earth with the remnants of the team minus scientist Esro Brachis who has opted to visit the alien worlds of Kur-Bai Empire with Mondrian, a beautiful Captain in the Kur-Bai Starfleet with whom he is infatuated. They are traveling with aboard a fleet starship commanded by Devenn, leader of the Kur-Bai super warriors known as the Elites. No sooner does Pulsar and company return to Sentinels HQ then a new super being calling himself Law appears and, taking control of the Earth’s communications satellites, broadcast a warning that the Kur-Bai are actually planning to an invasion the Earth. It falls squarely on Pulsar’s shoulders to deal with this mysterious new character while at the same time trying to recruit new members to help bolster the team’s decimated ranks. At the same time the Elites, nearing their home world, are attacked by a Kur-Bai starship crewed by powerful robots called Eradicators. Esro and the Elites discover a military junta has taken over the governing body of the empire and they have been labeled outlaws to be captured and imprisoned. Barely managing to foil the Eradicators, they make their way to a Kur-Bai space station and there learn the full extent of the events that have befallen their people. A power-hungry admiral of the fleet has successfully orchestrated a coup, killing thousands of loyal citizens in the process. A full scale civil war is about to erupt throughout the empire and Devenn and his Elites are caught right in the middle. 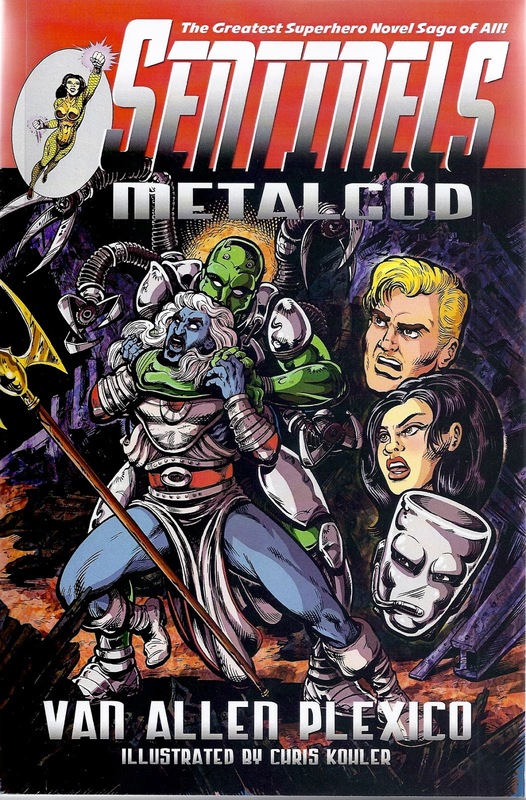 Those of you who are fans of this series understand its homage to Marvel Comics’ Avengers. “Sentinels – Metalgod,” now tips its literary inspiration cap to that classic sci-fi TV series, Babylon 5. Filled with political shenanigans, outer space battles, empire civil wars this book catapults readers into a whole now universe of action and adventure while at the same time injecting it with a marvelous wry commentary on today’s shallow attitudes about fame and popularity. The scenes of Pulsar meeting her German based fan club had this reviewer in stitches. Plexico’s enthusiasm for this series has never been stronger and that is evident on every single page. If you aren’t a Sentinels fan yet, it’s high time you checked it out. This kind of reading fun doesn’t come along every day. This is writer Bill Craig’s sixth Sam Decker novel and it rocks. 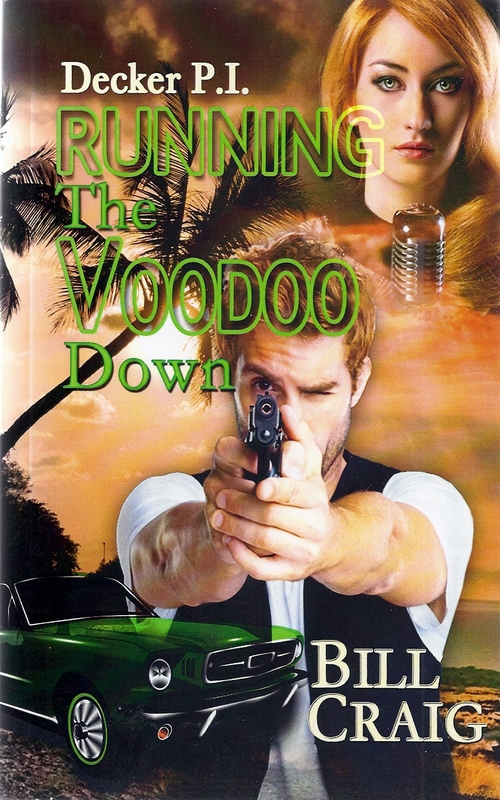 Decker is a private investigator living in the Florida Keys and he’s one tough customer. A former Drug Enforcement Officer, he despises incompetence in police work almost as much as corruption. When beautiful young jazz singer, Carly Kinnebrew, is kidnapped after a performance in a Miami nightclub, the police ineptly handle the case believing the woman has merely fun off on some private escapade. When Decker is called into the affair, he immediately uncovers multiple clues that point to kidnapping. But not just a routine kidnapping for money. In his investigation, Decker learns the singer had been the victim of earlier abduction as a young child in New Orleans. There she had been sexual abused by a very twisted voodoo practitioner known only as the White Orchid Man. Only by her strength and will to survive had the girl managed to finally escape her captor and return home. When the police failed to track down the fiend, she and her mother went into hiding and the scarred child changed her in name in hopes the White Orchid Man would never find her again. Alas, Decker quickly comes to the conclusion that very horror has transpired and he goes into action, enlisting his circle of friend, both official, ala Police Chief Monica Sinclair, and private such as fellow P.I. Rafael Cortez and the massive Indian shaman Seminole Joe to aid him in finding Carly and help him save her from a truly horrible fate. Bill Craig’s writing is lean and mean. He waste very few words on extensive exposition, giving you a character or setting in economic phrases without slowing down his breakneck pacing. There are amble action scenes that propel this caper like majestic white water flowing over rocks. “Running Down The Voodoo,” is a terrific read and a wonderful introduction to a memorable cast of characters. Trust me, pick up this title and you’ll soon be hunting up the previous five Sam Decker books. It’s that good!